There appears to be growing consensus that a windy snow event will occur from tonight into tomorrow. The National Weather Service, with an issuance of a full-fledged Winter Storm Warning, is particularly bullish on this storm with a forecast of 3-5 inches of snow. 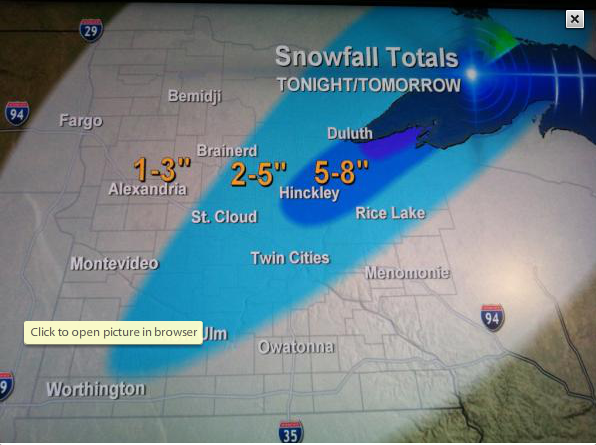 Fox and Strib tweets at 11 a.m.
A reminder that you can follow the Minnesota Forecaster on Twitter and Facebook. 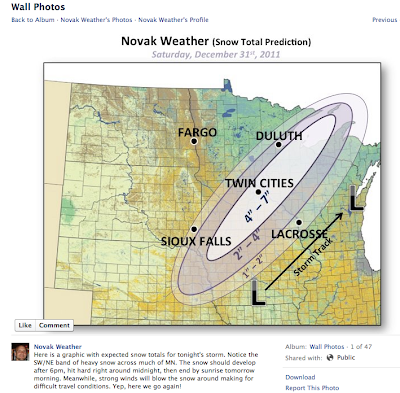 Way to dust ur self off and get on the horse Novak,I'm so pulling for you,maybe it has something to me loving snow as well or that I just want to use my damn new snowblower,Randyinchamplin where are u your awfully quiet,are u going to put out your 4 quadrent forecasts for around the metro. "Snow amounts of 6 inches or more in 12 hours or 8 inches or more in 24 hours are expected. These may or may not be accompanied by wind or other phenomena. A warning may also be issued if conditions will be approaching blizzard criteria, even if snow amounts are not expected to reach the aforementioned thresholds." Again, let's remember that life exists outside of the loop. With wind gusts forecasted in my area to reach 49 mph, I know that Carver County will be at blizzard level during parts of this storm, assuming at least a couple inches of snow fall. In my opinion, the risk in the forecast isn't that they tinkered the criteria for WSW (which, by my judgment, they didn't). The risk is simply the bust potential of storms in general this year. Novak, props to you. Nobody else seems to have seen this possible storm brewing. I had read/heard from a couple of outlets two days or so ago that a little bit of snow could potentially break out on the back end of the light rain event, perhaps a slushy inch. While the timing is pretty lousy, you seem to be alone in foreseeing this storm. I hope my kudos are not too premature and that this comes to fruition. I also hope that people use that gray matter in their heads and act accordingly tonight...though unfortunately I'm sure many won't. I tend to agree with the one to three inch snow range for the metro. I'm just not seeing this as a huge storm. I think it's being made into a bigger deal because it's NYE. It is going to be fun to watch this thing explode over NE & IA during the next 6 hours. You can see it coming together as we speak, especially when viewing the satellite images. It appears that a surface low is developing over southeast NE right now. Nice twist to the clouds already observed. Still not much of a precipitation shield, but that should blossom by late afternoon. By late afternoon, there should be a nice thermal gradient over Iowa for the storm to feed upon. BTW, as we all know, this is still not a slam dunk, done deal. Anything can happen. However, it is certainly encouraging to see nearly all model data trending towards a snow solution over the last couple of runs. Plus, the data continues to get more robust with each run. However, we shouldn't celebrate until we see the white's of the storm's eye; this would be a solid precipitation shield that moves northeast out of NE, SD & IA. I wonder if there will be a dry tongue? weather.com has upped its forecast to 1-3 and 2-4, depending on where you are in the metro. @AB Where in the metro does weather.com show 2-4? My area has 1-3. The forecast for Mpls is 2-4. @Randy, NWS has actually expanded the warning area (to the southwest) over the past hour or two. 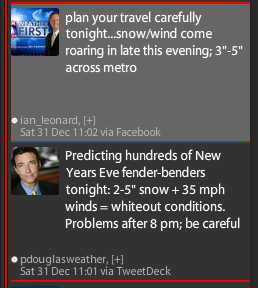 I think the weather service is committed now. If they downgrade, then you run the risk of people thinking it won't be as bad. Again, while totals may not be all that high (2-4 widespread seems possible), the combination of the wind and snow...plus any little rain that may fall with it will freeze under the snow, people should slow it down out there. It is amazing that we get a dusting of snow, and people are ending up in the ditch. I think starting with the advisory, and upgrading if necessary would have been the better route to take, but it is what it is. Agree with NovackWeather in that the sfc and upper level current data definitely show the system beginning to evolve. Latest model guidance has picked up on this thus deepening low, good UVVs and forcing and decent thermal ascent as 500mb vort max passes lead to snow developing and filling in the next few hours over SW MN. The sat shows clouds already thickening and enhancing so things are beginning to take shape. But, the wind -- uff-dah! 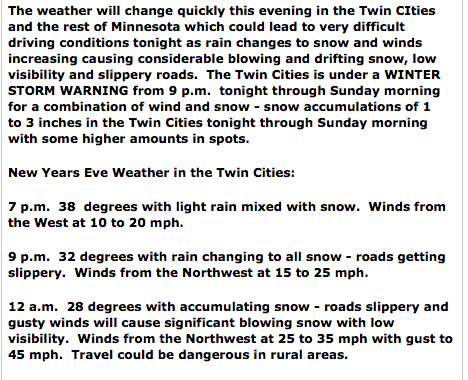 Those out and about tonight especially W of metro to ctrl and swrn/south central Minnesota need to be careful. Drunks, mixed precip changing to snow and strong wind and falling temps --- rough night to be a MN State Trooper, unfortunately. We are going to need this thing to quickly wrap-up & develop some sort of a trowel over eastern MN if we are going to get 4"+ of snow. Positives are that precipitation is beginning to develop/expand over southern MN and the low appears to be intensifying over southwest IA. Negatives are the speed of the storm and the dry air that is pushing east into western MN. I still think that we will have a 6 hour period of moderate/heavy snow over the metro. This will likely occur between 7pm - 1am. If so, then we should come close to or exceed 4" of snow. 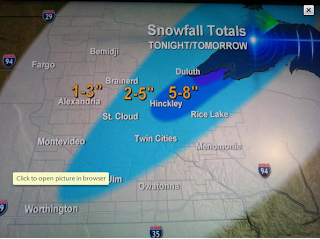 Gut feeling is that higher amounts will be southeast metro. ...and the doubt creeps in. Regardless, I'm heading out to enjoy my NYE. Seriously, where in the world is the Arctic air? Looking at the current temps, 30s still extend all the way up into southern Manitoba. I'm telling you, it is going to take a lot of dynamic cooling to get the snow that is expected. This storm better really blow-up this evening or we are disappointed again. and the precip type at 10pm notice the vertical lines over the east metro which indicate rain, and horizontal line in the west metro for snow. looks like the real problems will be south and west of the metro. Convective snows being witnessed over SW Minnesota -- let the dynamics begin! Rain has gone over to snow,coating already here in golden valley,coming down in a good clip,keep it coming mother nature! still raining in Rosemount.... 36 degrees, doubt we'll see snow for a while. Thick snow in Maple Grove!!!!! snowing like crazy in isanti huge snowflakes have about 1-1/2" already. Looks like a snowglobe outside. Winter storm warning downgraded to winter weather advisory. Rain starting to change over to snow in Rosemount.. just a few heavy flakes right now mixed in with rain. Flakes are flying in Rosemount. A strange sight indeed! GIANT snowflakes along Hwy 55 thru Plymouth and Golden Valley. Side streets were VERY bad in that area. We drove thru downtown and there were some people about, but probably far less than otherwise, especially given the decent temperatures. Back home in Roseville and it's not quite as bad. Hate snow. Since I have been harping on the pattern change coming up around the 10th of Jan, which by the way still looks on track. My Jan. forecast calls for above ave temps (about +3) with above ave snowfall. Way above....27.2"
well that was a dud,snow is gone,lucky if i got 2 inches. Actually seems pretty close to 2 inches in St. Paul. Happy New Year. 1.2" of snow in Inver Grove Heights (Dakota County) = the new definition of a Winter Storm Warning. 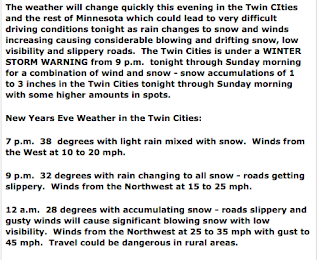 (1) I was listening to WCCO 880 am radio earlier today (mid-day 12/31/11) , and they were giving headlines of "Winter Storm Warning is in effect". And that was it. 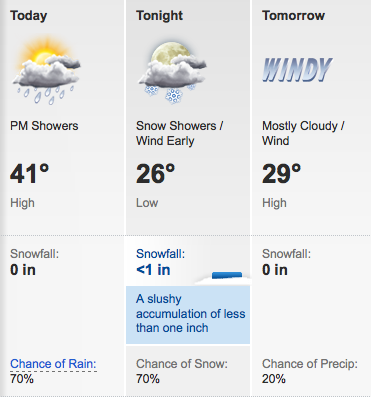 So, if you just listened to "Winter Storm Warning" and have been programmed to expect 6", then this was very misleading. They may have clarified later in the broadcast that the Warning was just for 2-4", but still, in today's situation if you indicate a WS Warning, you have to immediately follow with the fact that it is just for 2-4". Thought that was a little irresponsible. (2) The Weather Channel. Jeez, they have gotten away from their bread-and-butter of local on the 8's. Annoying that during the peak time of this event, they are playing marathon sessions of "Coast Guard Alaska", when I just want to see the radar on my TV. Clearly with those 2 comments, I am someone that goes into monitoring/tracking/record keeping mode, rather than those of you who are the forecasting folks. And now the compliment(s). Thanks Bill for hosting and everyone for contributing. I read all the comments during the winter season to try and grab any info I can from you guys and hopefully one day I will understand the forecasting side of weather. Here's looking forward to mid-Jan and Feb/Mar 2012 to make up for the winter thus far (image of my pint glass raised). Side note, I'm not even complaining about the NWS going to a WS Warning in the first place, although I probably should be since technically this wasn't even WW Advisory level...thoughts? Bill - Are you keeping running grades on the winter, if so, does anyone have a chance for extra credit? Correction to my last comment...WCCO = 830 AM. I'm originally from the NYC metro area, where WCBS = 880 AM. While I know measurements are taking from the airport, I live downtown and just walked from downtown Hennipen to Loring Park (and was out while it was snowing(, there is less than an inch of slush and the temperature is still above freezing (35 outside the balcony of my apt) and the trees are dripping and the slush is melting. So being a resident I am following Big Daddy and calling #dud! Haven't been outside yet but looking out I see bare driveway next to my garage... seems like we didn't even get 1" in Rosemount. I'm to the point where I'm about to stop surfing the weather sites in hopes of snow and just ride this loser winter out. Whats that saying about a watched pot? It was impressive for awhile last night. The flakes were huge and the snow was really coming down here in Rosemount. However, I woke up this morning to find that half of it had melted! We received about 1.5 inches. Ho hum...I guess given this never-ending pathetic excuse for a winter season we'll have to be happy with whatever meager snowfall we receive. This reminds me so much of the winters I grew up with back in the mid-Atlantic. Essentially, they were just glorified extensions of autumn but without the leaves. As kids we were delighted on the off chance an inch of snow fell. Of course, it typically melted within the same day. I moved up here because I wanted to live some place that had REAL winters! I won't lose the faith. I know it CAN happen. Last season was a dream...this year a nightmare... P.S. People, please stay OFF THE ICE!! There were several more stories on news last night about people around the state having fallen through the ice. I'll stop my rant now. Everybody, have a happy, healthy and snowy 2012! @Snow Meiser.. Where in the mid-Atlantic did you grow up? I grew up in northern Va. @Bill...I grew up in Delaware. @MN WeatherFan, Not sure if I'll bother with the running grades. Sometimes, I think the whole grading business is a little silly. Having done this for about a year now, I feel fairly confident in saying that in the end all forecasters tend toward the same average. They all seem to get it right sometimes and not other times. Some seem more conservative than others (which works sometimes) and they all communicate things a little differently, but in the end this is obviously pretty difficult stuff to predict! 1-3 inches of snow across the Twin Cities. Storm behaved as it should, like a maestro conducting an orchestra. I believe we need to take these last 72 hours, disregard them, but bottle them up for safe keepings because we can certainly learn from them. Honestly, I'm getting tired of saying we lack cold air, but it is the simple truth. I never thought that I would be saying this in the heart of winter in Minnesota; it just boggles my mind and I can't get use to it. If the precipitation had started out as snow over the metro, then it would be a different story today. 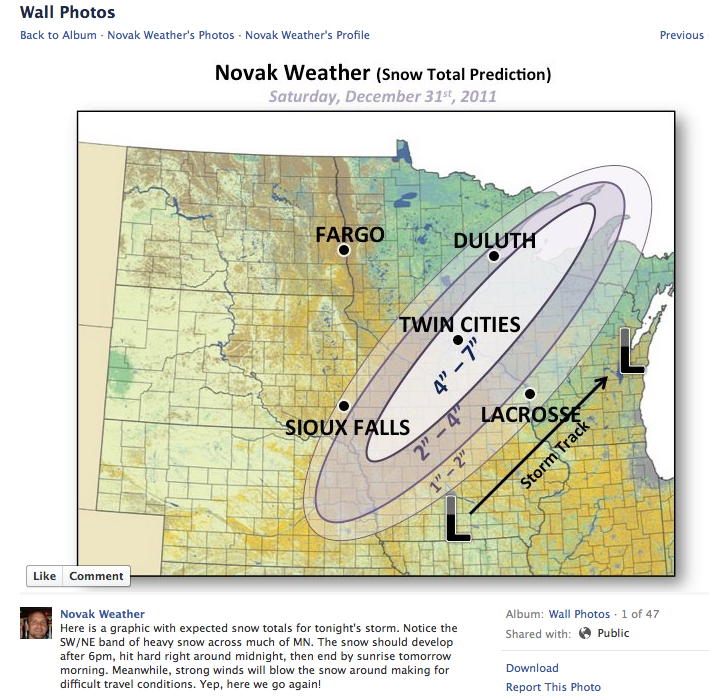 As forecasters, we should've known that lack of Arctic air was going to create issues. As with Thursday's storm (or lack there of), I'm very disappointed with the 12z model runs of yesterday's storm. The NAM came out bullish again with snow and some of us bought into it. I don't know how a weather forecaster can't look at these model outputs since we rely on them so heavily. Oh well, welcome to January everyone. I never thought I would say this, but I hope some bone chilling, below zero Arctic air makes an appearance. I just took a glance at the ECMWF temperature anomalies for much of next week and I'm can't believe that this warm regime is likely going to continue. It just seems that no Arctic air is able to pool up in western Canada. Warm air continues to pour over the northern Rockies and into the high Plains of Canada. Of course, this is often an important region for cold air since Arctic air likes to bank itself on the eastern slopes of the Rockies and surge south into the US. Is this pattern EVER going to change? @Bill...I just want to say what a great site you have put together. I've always been a huge fan of the weather...and especially a snow junkie (despite where I grew up). I'm glad I stumbled upon this forum. Keep up the good work! @Novak... I definitely appreciate your input regarding the forecasts, as well as your shared enthusiasm for winter. Hope springs eternal, but sometimes fact is stranger than fiction. I'm afraid this "winter" might be one of those times. A year without a winter is becoming more and more of a reality. I'm hearing now from different media outlets that the warm & dry weather should continue through at least mid-January. I hope we don't go from a non-winter to a long, cold spring. Time will tell. I for one hope spring is spring but summer is cooler. If I'm going to lose my winter it would take the sting out a bit to avoid the hot humid buggy summer. I do hope we catch up on rain... But doubt either of these will happen. My hope is this pattern changes before next fall.... And no el niño crap. This storm did meet criteria for a WWA for two specific reasons: it had a MIX of two types of precip, which can overrule the standard of 3-5 inches of snow, and the wind, mixed with any amount of snow, can warrant an advisory or warning at the discretion of the NWS if it is expected to be a significant factor in deteriorating conditions. Roads didn't get too bad in the loop, but two-lane highways/county roads in the outer ring metro are still in rough shape. Per NWS statement this morning: Northwest winds sustained at 30 to 35 mph with gusts to around 50 mph. So far, the highest sustained wind a KMSP has been 24 and gusts to 39. While the day's not over, one has to wonder if the winds were over sold as well. Is the gradient not as tight as expected? Looks to be about 30 miles per millibar. Sustained 25-mph wind isn't good enough for a wind advisory? Why not? Not debating the merits of whether a wind advisory was appropriate, just saying the winds don't seem to be as strong as advertised by virtually all weather outlets. Regardless of their actual strength, the winds are making a mess out of my cable signal, which is wreaking havoc with my day of watching football and basketball. @AB, Wow, this amount of snow messes with your signal? I had problems with storms when I had satellite TV but haven't had any cable problems caused by weather. New grading post just issued. No, not the snow...the wind. My cable company is terrible, and anytime there's wind, my signal is pixelated and skips. It's ridiculous. I thought cable lines were supposed to be underground! @AB could be causing havoc farther up the line. It's overground somewhere.